Euston station is to provide the terminus of the UK’s first high speed rail network, HS2. Euston station is to undergo a major redevelopment to provide high speed lines and a vibrant, landmark station. Under the government’s current plans, the station footprint will be extended to the west and lengthened to the south to provide room for high speed platforms and a newly built concourse. The first high speed lines are due to be operational in 2026. The new station design must address the needs of a growing railway and also promote regeneration of the local area with new homes, offices and commercial premises. The redevelopment is subject to an open tendering process. The station footprint today showing The Euston Estate and Euston Square Gardens. Major redevelopment plans for Euston were first drawn up in 2007. Capacity issues at the station necessitated an overhaul of the 1960s terminus and Network Rail announced a “once in a generation” development opportunity to bring the station into the 21st Century and act as a catalyst for regeneration of the neighbouring communities. 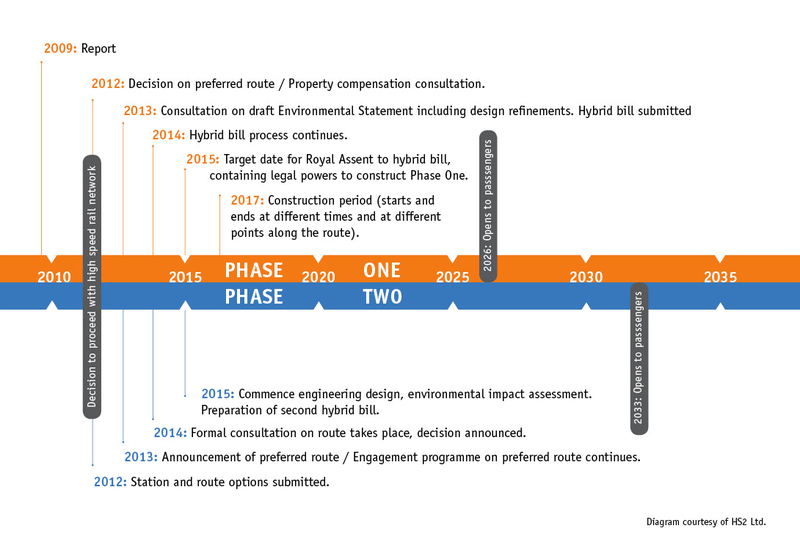 The subsequent decision to bring HS2 into Euston further builds upon these development plans. Passenger trains out of Euston are also overcrowded. The new high speed line should significantly increase capacity and free up space on existing lines for commuter, rural and freight train services. Without HS2, rail operators forecast that the West Coast Main line, a key route out of Euston and Europe’s busiest mixed-use railway, would run out of capacity within the next decade. HS2 Ltd argues there is “no other way” to make the “step-change” required to the UK’s transport capacity. Click here for the latest HS2 news. High speed rail: Investing in Britain’s Future – decisision and next steps. Today, Euston station is one of Britain’s busiest interchanges. An estimated 80 million passengers pass through Euston interchange each year. Footfall through Euston is at record levels and continues to grow year on year. Irrespective of the government’s plans for high speed rail, the comprehensive redevelopment of the station is urgently required to reduce congestion at the station and allow for future expansion. The 2007 white paper identified Euston as a key station requiring increased capacity to meet future demand. HS2 – the UK’s largest transport infrastructure project for a generation… the biggest infrastructure scheme in the western world.